This handcrafted, Western style coffee table blends full grain leather with patterned, real cowhide. The open, square top of this coffee table is covered with rich, brown, full grain leather. 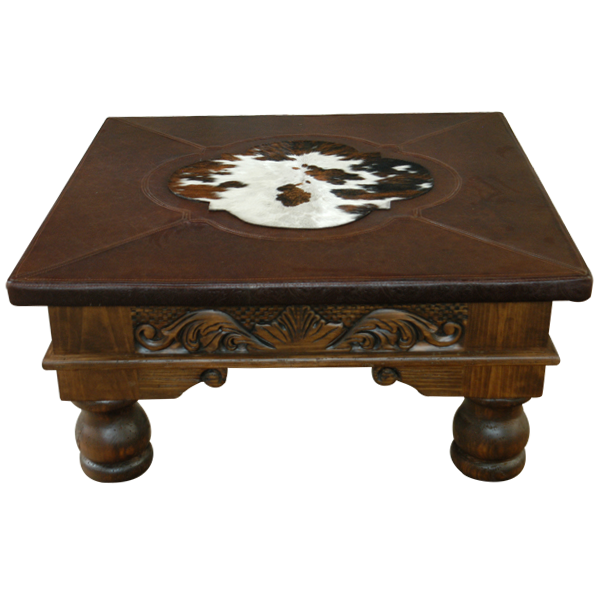 Centered in the table top is a Western design of contrasting, brown and white cowhide. The leather is double stitched together for extra strength and durability. The base of the coffee table is embellished with spectacular, hand carved, floral and scroll designs. Directly above each leg is a hand carved, solid wood, scrolled support, and the coffee table rest on sturdy, hand turned legs. The coffee table has an elegant finish, and it is made with the best, sustainable, solid wood available. It is 100% customizable.